For centuries, man dreamed of being able to soar above the clouds. They studied birds, trying to find the secret within the wings. Eventually, the Wright brothers invented the airplane, and modern air travel took off (ha, get it?). Unfortunately, all those years of wondering and designing airplanes were actually pointless. 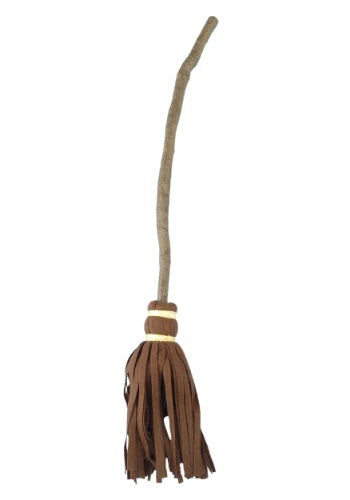 Nothing makes flying easier than a good old fashioned witch's broom. You hop on, kick off from the ground, and away you go! Now, brooms might not be as comfortable or luxurious as a first class cabin, but they're fast and more importantly every flight is free. Sure, there's no in flight movie, but you'll be too busy admiring the countryside passing below you to care. And your kid keeps demanding a Nimbus 2000, right? Well tell little Harry Potter that he doesn't need a Nimbus 2000. Any good witch's broom will work for flight, and for sweeping too! Give them their broom and put them to work at the same time. Now that's just smart parenting. Love it! Bought this for my 4 year old and was impressed with the quality. Light weight and perfect size also.